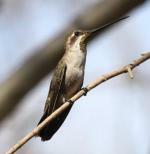 Lucifer Hummingbird: Fairly common in the Big Bend area of Texas, rare to casual in scrublands, arid slopes, and canyons in southwest New Mexico and southeast Arizona. Spends winters in Mexico. Preferred habitats include arid slopes with agave and yucca. 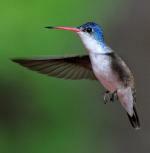 Lucifer means “light-bearing” in Latin, so the name probably refers to the iridescent plumage of the Lucifer Hummingbird. In the past this bird was captured to be stuffed and mounted or sold alive. 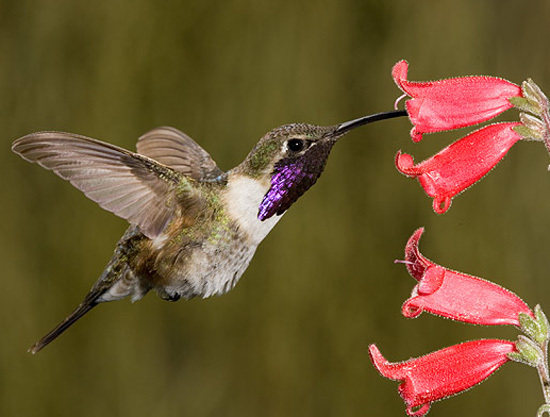 Males perch atop plants and launch into aerial displays lasting up to 45 seconds in an attempt to attract a mate. 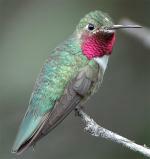 A group of lucifer hummingbirds are collectively known as "an inferno of hummingbirds."